Soumya ran around the place in search of Rudra. Suddenly she saw him sitting on a rock near the river. Rudra struggled to continue.He closed his eyes in pain and said:I hate you.Just go away. Soumya:Stop it.Don’t lie anymore.The truth is that you love me more than anything.I know why you pretended to be a cheater. 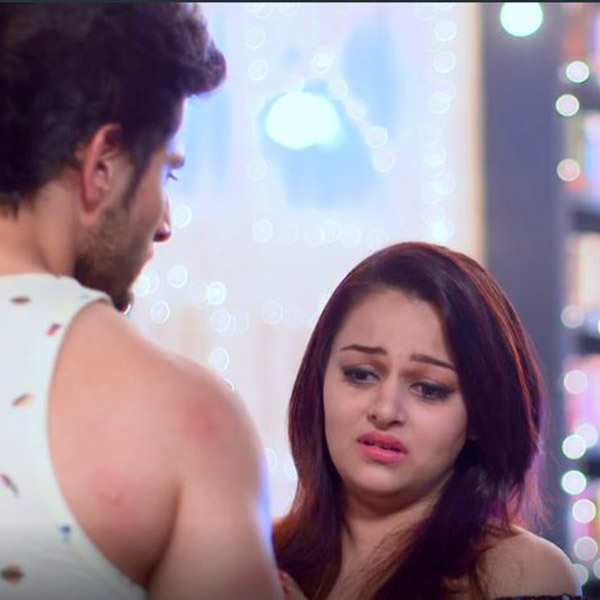 Soumya cried:Your heart pained every time when you pretended to hate me.Your heart scattered into pieces when you push me out of your life.But without realizing that I blamed you. He took her into his arms completely shedding tears :Soumya…no ..please.I can’t see you in pain. Soumya:If you can’t see me in pain don’t leave me. Soumya:I can’t live without you. Rudra:Even I can’t live without you. They both burst into tears and embraced each other tight. Rudra:But please try to understand.Even if we get back to each other we won’t be able to live together. Soumya:I don’t want to hear any of your stupid excuses.You should be ashamed of believing in such stuffs even though you were brought up in London. Rudra:But Soumya..what if its true?I love you.So I can’t risk your life. Soumya:Let it be true.But still I want to live with you.Even if its just for one second I want to live with you.Just one second as your wife Rudra. Soumya:If you think our wedding can kill me I am telling you that if you don’t marry me I will kill myself.Did you get that?So you decide if you want me to live for a few more days or should I die now? Rudra:What are you saying Soumya? Rudra’s and Soumya’s parents who followed Soumya without her knowledge had reached there and got shocked to hear what Soumya said. Rudra Soumya looked at them in shock. Raghuvir:What are you saying Soumya? Soumya:Can’t you understand what I said?If my wedding with Rudra does’nt happen I will end my life here. Suddenly Rudra held her tightly with anger:How dare you say that you will die?You never thought of me before taking a decision to die?I hate you for leaving me alone to die. Rudra cupped her face in his hands:I will marry you. Kaise Jiya Jaaye Tum Bin. Soumya smiled tearfully and embraced him. Kaise Jiya Jaaye Tum Bin(Sanam re). Their parents watched this tearfully. Raghuvir:Some love stories are so powerful that even if we try they can’t be broken.We have no other option than to accept it.We become weak and fail before their true love. Santhosh:Look at their pure love.I don’t think God can be that cruel to separate them. Radhika:Their hearts are connected to each others.They can’t be separated. Sarla:God…what is this?Please keep them together forever.They can’t live without each other.They are each other’s breath. Rudra Soumya got ready in the bridal attire. They looked at each other romantically. They took seven steps around the sacred fire making the nature witness it. Rudra took the nuptial chain in his hand.Soumya was very happy as the most awaited moment came. He tied it around her neck. He marked her as his by adorning her forehead with vermilion. They said to each other:We belong to each other completely. Bhavya came with a man. Bhavya:Congrats Rudra and Soumya.I can’t tell you how happy I am to see you both together.I was very upset seeing you both away from each other.But no such worries.All the best for your future.Wish you a long married life. The man who came with Bhavya:Happy married life. Soumya wondered who that guy is. Bhavya smiled holding Prateek’s hand:The love of my life.My fiance. 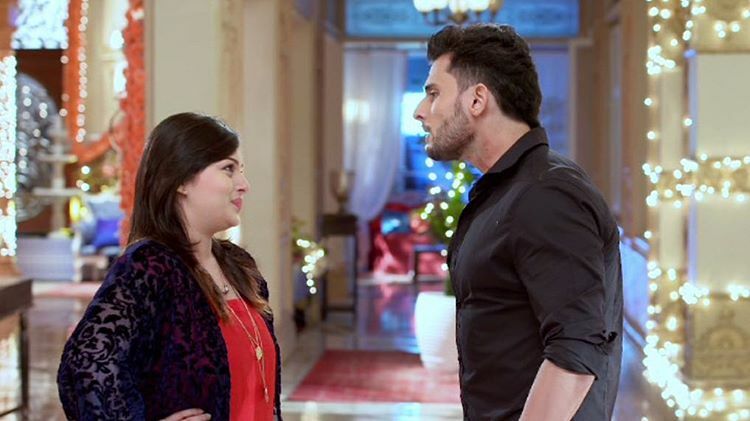 Soumya:I am sorry Bhavya.Without knowing the truth I insulted your pure friendship with Rudra. Bhavya:It’s ok Soumya.It’s not your fault,but this duffer Rudra’s fault.Purposefully he made you feel that we are in a relationship. Prateek joked:Naughty Rudra..you spoiled my Bhavya’s image. Prateek patted his shoulder:Hey..I was just pulling your legs. Rudra:Though doctors Prateek and Bhavya are amazing dancers too.They dance for hospital annual functions. Rudra:Yep..so Prateek Bhavya..we won’t leave you guys unless you both dance. Bhavya:After all it’s our best friend Rudra and his beautiful wife’s wedding function. Prateek Bhavya did rocking dance and Rudra Soumya enjoyed a lot. Rudra came near Soumya.She was shy. He pulled her closer making her blush. He embraced her from behind:Let’s make our love complete. and took her to the decorated bed. He threw flower petals at her passionately.She smiled. He caressed her face sensually with a rose.She closed her eyes feeling his passionate love. He removed all her accessories and pulled her closer with passionate romance. They rubbed each others nose with theirs sensually. They got lost in loving each other passionately. and tried to fill the parting of her hair with vermilion with a sweet smile. Suddenly Rudra took vermilion from her. He put it on her hair parting.She smiled. Soumya:Now I am the wife of the person I love.No one can separate us.We will prove that our marriage is our protection and not the way to death. Soumya cooked sweet for all as a custom.Her in laws praised her. Soumya to Rudra:Everyone liked it.But you did’nt say if you liked my sweet or not. Rudra held her hand:I will answer your question in a different way. He pecked her palm softly. Soumya:If your answers are sweet and romantic like this I will always ask you questions. Rudra smiled naughtily:By the way to get kissed by me you don’t need to ask me questions.Otherwise also I can give you sweet kisses. She became shy:You are too romantic. He pulled her closer:Yes I am. Tera karam re mujhpe hua ye [x2](Sanam re). Soumya went out for shopping.She got Rudra’s call while crossing the road. Soumya:I am going for grocery shopping.Now crossing the road. While talking to Rudra she did’nt realize a car coming that way and it hit her.She fell down screaming. She murmered:Rudra…Rudra…I will come back.I won’t leave you. Rudra thought:Why did I feel that Soumya screamed?What happened to Soumya?Why is she silent now? The car driver picked up the phone and said:Who are you?The girl who was talking to you met with an accident. Soumya was in the hospital struggling for life. Rudra shouted at the owner of the car:Why did you put my wife in this condition? He:I am sorry.Trust me.I did’nt do it intentionally.I am upset.That’s why I brought her here. The doctor came:We tried our level best.But there is no hope. Rudra was shattered.All were crying. Sarla cried:I told you to stay away from Soumya,Right?See…what happened…my Soumya…the astrologer’s words are coming true. Rudra’s heart was pricked by her words. Rudra cried in guilt:Because of me only Soumya is losing her life.If I had’nt married her she would’nt have faced this. Rudra stood near Soumya and wept:Soumya…I am sorry dear..I only put you in this condition. hello…. this is so emotional and lovely . i have one request to u pls introduced shivom in ff.. will be more happy… without shivom ru is incomplete…..